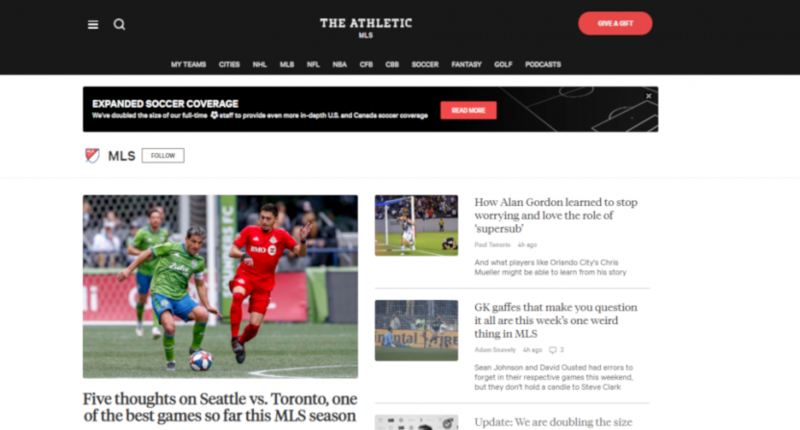 When The Athletic took flak last week after several writers who had been covering local MLS and NWSL teams for them tweeted that they had been told they were no longer needed, the response from a site spokesperson was “We have a big announcement on the way, one that the whole company is very excited about. We’ll be sharing that update very soon.” Well, that announcement has now dropped, but the criticism hasn’t gone away. will you be replacing the Portland Timbers writer you axed last week with another local writer, or relying on coverage from the Seattle-based writer? need to know for subscription renewal purposes. thanks. So you hired 4 writers that cover MLS teams and got rid of others. How does that help the teams with no coverage? Some great writers – shame you dropped some local staff last week in order to “double” the next week. Regional coverage, even with good writers, is not the same as local. This isn't regional coverage. Matt isn't the only person providing coverage of the Timbers. I'll be writing Timbers stories, Sam will be writing Timbers stories. It isn't based on where writers are living in the country. We're all hired to write good American soccer stories. I just disagree with this point. We didn't have freelancers for all 24 teams, we haven't eliminated anywhere close to all of our freelancers (most still remain) and we do believe we can provide more and better in-depth journalism covering the American soccer scene. Yes, Pentz might pop down to Portland. But that doesn't mean me or Sam are going to stop writing Timbers. Yes, Pablo will cover DCU and can easily pop up to Philly. But if he has a great Dallas story, no one is stopping him. If there are good stories, we're going to tell them. I've written features on teams in every type of market in MLS, and we'll continue to do so—only now with seven people telling those stories full-time instead of one. It may not be one per week for every team in MLS (it never has been, many markets had no freelancers), but it will be more MLS coverage than ever before and more in-depth stories on all teams. I believe the level of our work will justify the changes. And there may well be people interested in the stories told by these various writers about certain teams and players, even if those writers aren’t regularly covering the team in question. And maybe the loss of subscribers who were there for the previous forms of beat coverage won’t be all that major; The Athletic’s founders have spoken time and time again about how data drives their decisions, so it wouldn’t be surprising if the site has data (on both signups and articles read) that it believes justifies this change. And maybe the old setup wasn’t producing enough results for them. But this soccer move is interesting, because it seems to be taking a bit of a different approach to what The Athletic has done with many other leagues. A lot of their pitch has been on providing better beat coverage than local newspapers, especially when it comes to NFL, MLB, NBA and NHL teams. And a lot of their focus has been local, with different sites for each city in an attempt to appeal to fans there. Now, they’ve hired some national voices for coverage of all those aforementioned leagues as well, and they’ve also gone more national in certain areas, especially college football and college basketball. But even those sports have seen attempts to expand the site’s local presence, which makes sense considering that many fans are locked into their particular team and not overly concerned with a wider perspective on the sport. Dialing down existing local coverage from freelancers in favor of more coverage from new national writers is a different move than what the site’s done before, and one that’s worth watching. And this perhaps speaks to some overall challenges for The Athletic. At the moment, they’re trying a lot of approaches, including a new podcast network and some video efforts, and they have a lot of money to do that after their latest funding round. But their resources aren’t infinite, and expanding to some new areas may mean pruning back elsewhere; that appears to be what’s going on with the soccer moves. And while bringing in new writers and new focuses may appeal to some subscribers, taking away existing coverage also creates some backlash, as we’ve seen from the response to these soccer changes. We’ll see how this works out for The Athletic in the end.